For Content Marketers, making our pages more clickable in search is a major victory. Because it’s so important, it raises the question of how to improve organic CTRs. Targeting a specific keyword with optimized and valuable content. By targeting a specific search term, optimizing your content, and providing value, you’ll organic CTRs improve. Let’s break this idea down step-by-step. Want to rank number one on Google and skyrocket CTRs? 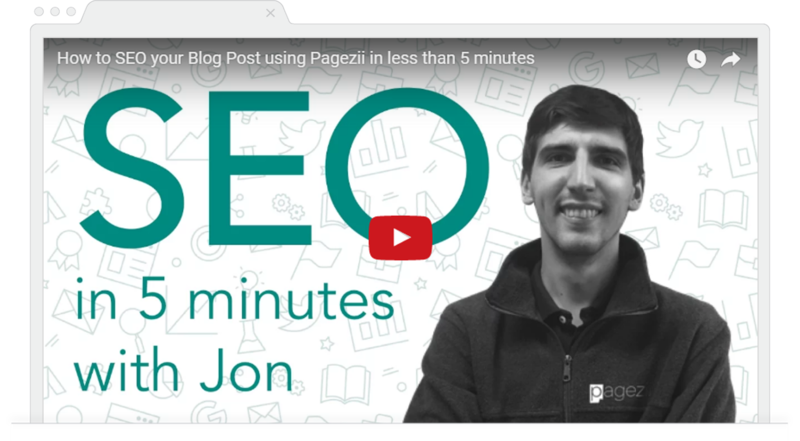 Check out our blog SEO in 5 minutes webinar. There’s tons of content out there. And unless you have a powerful domain, it’s going to be tough targeting a broad keyword. 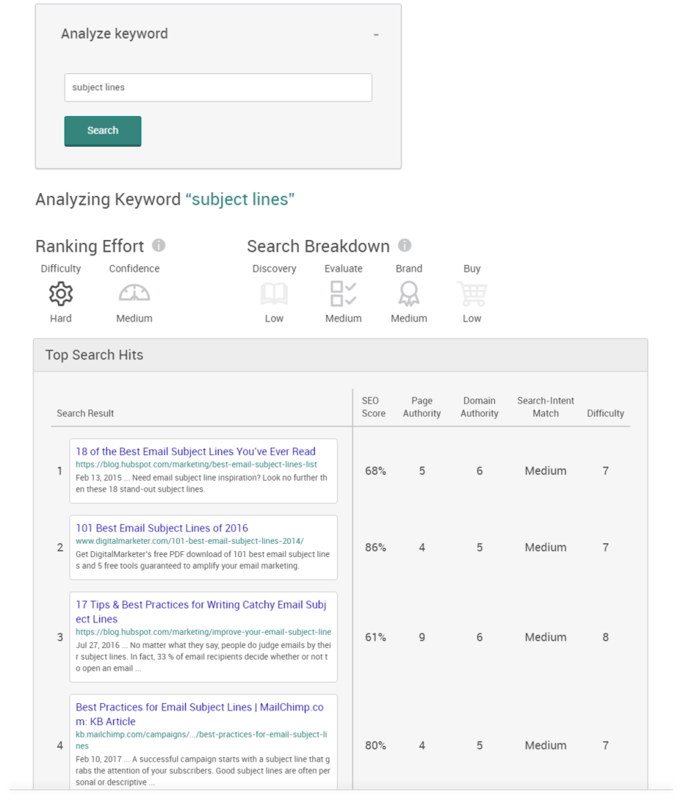 You want to write a blog post targeting “Subject Lines”. Right off the bat, you can see it’s going to be tough ranking high for this keyword. You’re better off focusing on a specific keyword target. This means targeting a long tail search that hones in on a narrow topic. Because you want higher CTRs, you’ll have to give searchers exactly what they want. It’ll result in fewer impressions, but it will also boost CTRs. If you’re a Digital Marketer looking to improve CTRs, you probably know a thing or two about on-page SEO. You have to optimize all aspects of on-page SEO. Here’s an unoptimized page SEO score summary. This SEO score summary shows my keywords aren’t mentioned in important elements. By optimizing key on-page elements, I increase my chances of improving organic rank. This is going to have a direct effect on my organic CTRs. Hitting a 99% SEO grade is not always possible. It depends on the keyword your targeting. Some keywords don’t make sense in specific on page elements. Content Marketers have to be sure they’re writing for human eyes first and foremost. So sacrificing content readability for SEO can actually end up hurting you in the long run. Strive for high SEO scores, but not at the expense of readability. Find the perfect balance of both. After you’ve honed in on your keyword targets and optimized your content, it’s time to analyze the content itself. What you should look for are engagement metrics. These are metrics that measure bounce rates, time spent on page, and visitor site tracking. Bounce rates are a percentage of single page visits. It gives you an idea of how engaging your content is. AKA after visiting your page, do users stick around? Time spent on page is straightforward. It’s the average time users spend on your content. If you write a page that should keep users reading for 3-4 minutes, but they leave after 30 seconds, you know you need to optimize. Making the content more dense and punchy can add a ton of value. Finally, you can track your visitor site usage. Your content should have a specific goal to achieve. Maybe a visitors comes to your blog and from there tries a free trail. Or downloads a case study. Whatever that goal is, treat it as a conversion, and optimize the content if it’s not met. For Content Marketers, the company blog is a pillar in their strategies. And you can see if your content provides value by tracking this data week in and week out. These blog metrics show if you’re adding value through your content. As you keep weekly tabs on this data, you’ll want to see lower bounce rates and higher time spent on page. We’ve gone over the blueprints to improve organic CTRs. Try this formula out on your own content, and keep the discussion going in our comments section below.